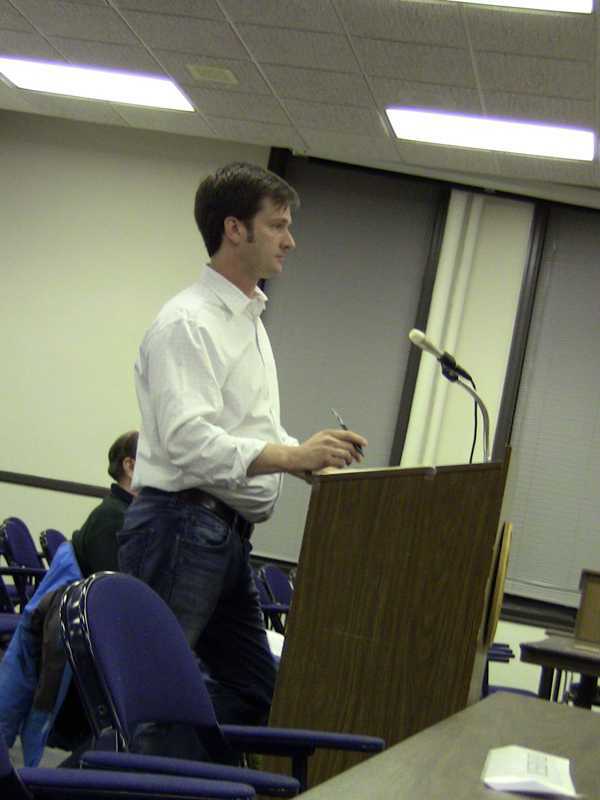 Michael F. Smylie of Winnetka speaks in a city meeting of his plan to makeover the facade and surrounding locations of the building on 1615 Oak Ave. which he plans to make in to a brewpub, the first of its kind on the North Shore area. Evanston’s first brewpub moved a step closer to opening Tuesday, once the city’s zoning board of appeals approved the removal of off-road parking spaces in front of the business. Winnetka resident Michael Smylie said he plans to open Smylie Bros. Restaurant and Brewery by the end of this summer at 1615 Oak Ave., previously the Illinois Unemployment Office. Smylie requested permission to replace the off-road parking lots in front of the property with an outdoor patio, stating that cars entering those parking lots are a danger to customers. The 30 parking spaces on the north side of the property would accommodate the customers, Smylie said in his proposal. The board said city laws require the business to provide off-road parking spots, but the city will provide three metered spaces on Oak Avenue to fulfill that requirement. The board also recommended Smylie provide weekend valet parking to alleviate demand for parking spaces. Smylie estimated 150 customers would visit the brewpub on Fridays and Saturdays. Board member Beth McLennan said the parking lot removal could put additional pressure on traffic in the area but would ultimately benefit Smylie’s business. The restaurant would serve craft beer as well as wood-fired pizza and southern barbecue, Smylie said. Smylie Bros. would target customers ranging from working professionals to baby boomers. “We’re going to take the pub concept and elevate it so that it is not fine dining and not bar food,” Smylie said. The City Council approved the brewpub’s liquor license in October, but it will also have to receive a liquor license from the state before it can open.